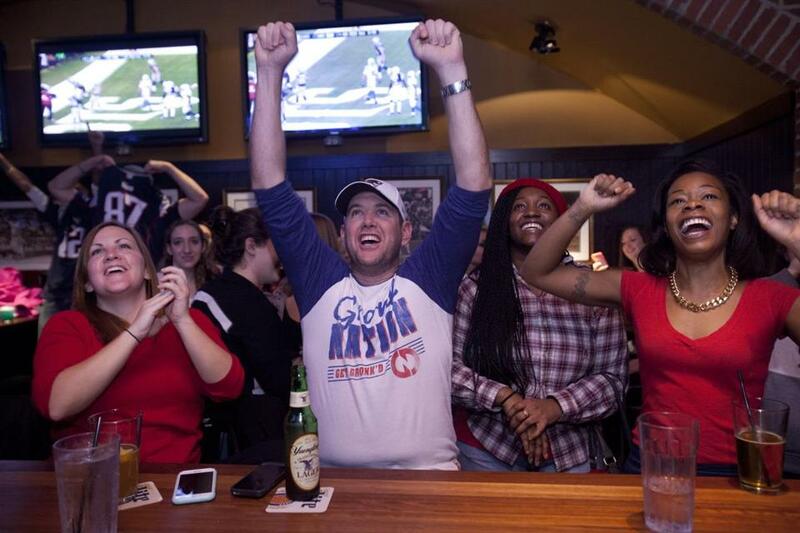 Fans watched the AFC playoffs at Cask &apos;n Flagon. Are you ready to fuel your Super Bowl fandom with fried food, beer, and Pats gear? Good. If you’re tired of hearing about deflated balls, these spots will pump you up — with Tom Brady nail polish, cool clothes, venison hot dogs, beer, and plenty of TVs. Whether you grab a stool and watch the game at your favorite bar, get your grub to go, or just need a place to restore your faith in the game, we’ve got you covered. Stop in beginning at 11 a.m. to watch the game on a new 70-inch TV. If you’re not a football fan but want to celebrate anyway, console yourself with their board games, shuffleboard, and plush leather couches. The newly revamped bar is open for business with a trio of special $10 game-day miniature “dawgs” wilder than Bill Belichick’s temper at a press conference. Indulge your animal instincts with alligator smoked sausage, bison, and venison from chef Brian Poe. If things look bleak for the Pats, drown your sorrows with a $24 Scorpion bowl soaked up with $7 chicken wings. Or revel in every sweet score with . . . the same menu. Through Jan. 31, bring a new, regulation-size football (ahem, inflated or not) to either location and get a free appetizer. The bar will donate the ball to charity organization Good Sports. As for Super Bowl Sunday, the Cask gets crazy. If you want a shot at getting in, better get there early. Watch the game on big screens at the bar and pig out for $25 on a buffet stuffed with game-time snacks like wings, mac and cheese, and seven-layer dip. Beer pitchers are $10. Sweet. At SA PA’s Cleveland Circle location, get party wings ($29) and homemade egg rolls ($15) for groups of four, while watching the action on 60-inch TVs. Sapporo, Green Head IPA, Full Proof Barstool Golden Ale, and PBR are a mere $2; pitchers are $15. Graze at the resort’s Fireplace Room on game day from 10:30 a.m. until 2 p.m. and watch pregame festivities in front of a cozy fireplace. Feast on brunch standards and football snacks such as Italian sausage, chicken wings, nachos, and corn dogs. Adults $25.95, kids $8.95. Lulu’s wins the glutton-in-training award for its Super Bowl menu: poutine with smoked bacon, bleu cheese, and wing sauce; “tot-chos” in cheese sauce, sour cream, and short ribs; seven-layer dip; and free chips and salsa. Would Gisele approve? The lovable Somerville pub hosts its second annual all-you-can-eat football BBQ tailgate from 5-9 p.m. For $14, celebrate with ribs, pulled pork, smoked wings, and Southern sides. No matter how the night unfolds, you’ll go home satisfied. No flash, no frills: This down-to-earth pub in Jamaica Plain is a favorite for loyal fans. Unless you’re going to Glendale, this might be the most intense game day experience you can have from 2,300 miles away. For $50, enjoy a pregame appetizer buffet, a half-time entree buffet, and two drink tickets. Oh, yes, there are also 145 HDTVs. You read that right: 145 TVs. Get a $49 party platter for six with Sicilian-style pizza, wings, and the hitherto unseen pepperoni-flavored popcorn. Call in orders by Jan. 31. 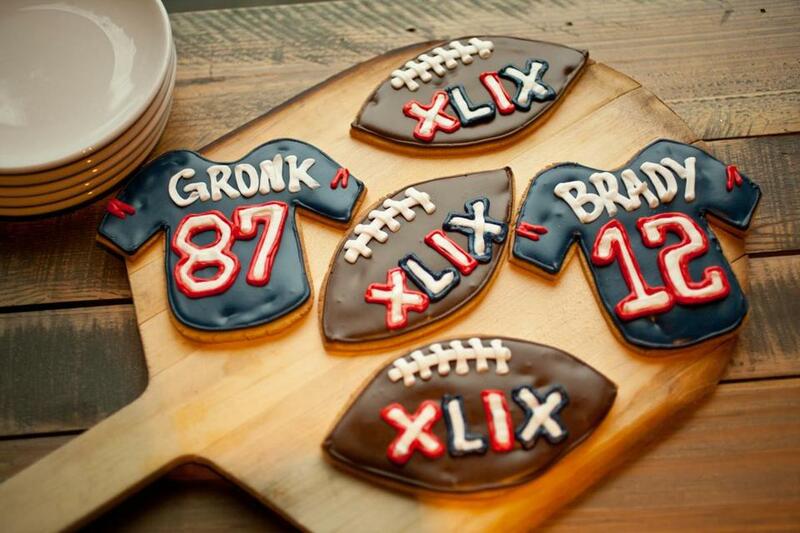 Stop into Commonwealth’s market this week for homemade frosted sugar cookies in Patriots logos, available a la carte or in bulk, plus sandwiches named for Pats players. From Jan. 29 through game day Feb. 1, buy a pint of frozen custard and get a second pint in your favorite flavor at the Shack’s Boston-area locations. They’re also giving out free mini Shack footballs — inflated, presumably. This Harvard Square souvenir shop has a cute assortment of Patriots curiosities and baby clothes for the mini fan, plus gear for grown-ups. For the well-groomed mega-fan, the manicure masters at MiniLuxe offer a “Numbah 12” blue nail color in honor of Tom Brady. If the idea of beer and wings frightens you, prepare for the big game by visiting Nourish Your Soul until Jan. 30 for an 11-pack of cold-pressed juices at 10 percent off. You’ll get a voucher for another free juice, redeemable if the Pats win. This high-quality sportswear shop, a fan favorite, sells an exclusive line of Tom Brady sweatshirts. Because sometimes you have to proclaim your love for the Pats with a hoodie, a jersey, a cap, and a manicure. Not into hoodies and hats? Here’s where you’ll find a jaunty Patriots polo or sweater. Your dad will love it. In the shadow of Gillette Stadium, you’ll find flags, footballs, shot glasses, cheerleader swimsuit calendars, kids wear, leis — you name it, they sell it. 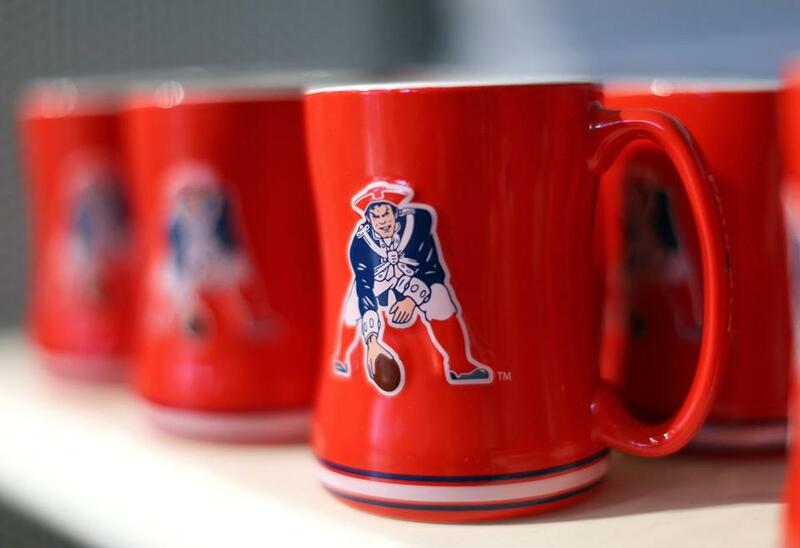 Mugs and other swag from the Patriots Pro Shop will get you ready for the Super Bowl. It’s been a long, twisty run-up to Super Bowl XLIX. Get your moment of zen with a trip to the Hall at Patriot Place, where the Patriots’ greatest victories are highlighted. The museum has limited hours on Super Bowl Sunday, from 10 a.m. until 2 p.m. After all, shouldn’t you be home, watching the game?